Immediate conservation action is vital if the evocative bubbling song of the Curlew is not to be lost from Shropshire forever. There is a real danger that breeding Curlews will become extinct here in the next few years. Atlas work in 2008-13 did not find Curlews in 62% of the tetrads where they were found in 1985-90, a massive contraction of range. Over the same period, the population has declined by an estimated 77% in only 20 years, from around 700 pairs in 1990 to around 160 pairs in 2010. Monitoring carried out by Community Wildlife Groups shows that numbers are still going down. Nest monitoring by the Stiperstones-Corndon Landscape Partnership Scheme in the County hotspot, with a quarter of the breeding pairs, found disastrous breeding seasons in 2015 and 2016, when apparently no young fledged. The decline continued in 2017, as summarised here. Nationally, Curlew was added to the Red List of Birds of Conservation Concern in December 2015 because of a decline of 62% since the 1960s. Internationally, the UK has a special responsibility for Curlew, as we have an estimated 28% of the European breeding population, with more in winter, and an estimated 19-27% of the world population. Shropshire Wildlife Trust (SWT) and SOS have established a long-term County-wide ‘Save Our Curlews’ campaign, funded by a joint appeal. It is being co-ordinated by SWT. A multi-agency Shropshire Curlew Group, including SOS, has been set up to oversee the campaign. The Terms of Reference can be found here. An outline strategy has been agreed, extending the strategy developed by the Upper Onny Wildlife Group through the Stiperstones-Corndon Landscape Partnership Scheme (LPS) and ‘rolling out’ the lessons across the County i.e. develop Community Wildlife Groups (CWGs) to survey areas that hold breeding Curlew, to identify nesting areas, and then work with the landowners and farmers to find and protect the nest, and assess the outcomes. This must start by working with landowners, finding and protecting nests and monitoring the behaviour of chicks through radio-tagging. Expert help must be bought in to do most of this, and make maximum benefit of volunteers’ time. The campaign will work in cooperation with, and support, the CWGs, which collectively monitor more than half of the Shropshire Curlew population. Since the launch of the campaign and appeal, the Stiperstones Corndon Landscape Partnership Scheme (LPS) Curlew Recovery Project announced that it is continuing under the name “Curlew Country” beyond March 2018, under the auspices of the Game and Wildlife Conservation Trust. It will continue with the nest monitoring and protection and other activities carried out in 2017, but it does not wish to participate in the Shropshire Curlew Group. SCG therefore decided to continue to implement the agreed strategy, starting with landowner liaison and finding and protecting nests in the Upper Clun and Clee Hill areas in 2018, if sufficient funds could be raised. The appeal has been successful, and project work in both these areas was undertaken in 2018. A summary of the project work, and the monitoring by the CWGs, in 2018, can be found here, in MS Word format (.docx). The 10 CWGs covered 137 of Shropshire’s 870 tetrads, and over 270 people contributed over 2,200 hours to the surveys, a clear indication of the commitment of local people to saving our Curlews. Between them, the Groups found 80-100 territories. A summary can be found here, though the precise figures need to be checked at CWG meetings up to the end of March 2019. A joint appeal has been launched to fund the campaign. The SOS Board agreed to donate £2,500 to the 2018 campaign. The Board decision can be found here. SOS members, and everyone else who wants to ensure that Curlews return here to breed, are also requested to donate. The appeal letter from the Presidents of the SWT and SOS is available by selecting this link. The form which you can print and fill in to make a donation, is here. The Appeal is being administered by SWT, but will be accounted for separately. If you pay UK tax, please fill in the Gift Aid declaration. This enables SWT to re-claim the tax you’ve paid on the amount you donate, so each donation is increased by 25p in the £1. Funds raised by the Upper Onny Wildlife Group (UOWG) Curlew Appeal (over £5,000) have been transferred to the SWT/SOS ‘Save Our Curlews’ Appeal. The campaign will need to operate for many years to come, so the appeal will continue. National conservation organisations are raising money for their own projects and priorities, but none of this money will be spent on saving Shropshire’s Curlews. The fate of the local population is in the hands of Shropshire’s people. The status of Curlews in Shropshire, a summary of the monitoring carried out by the CWGs since the first one started in 2004, and other aspects of the campaign, can be found here. In 2018, Curlew Country concentrated on “headstarting”, by removing eggs from nests, incubating them, rearing the hatched chicks in captivity, and releasing the fledged young into the wild, under license obtained from Natural England. Twenty-one were released. It is not known if these young will survive and return to their natal area in 2020, or whether the absence of contact with parents will have any effect on their behaviour and life skills, so the results need to be carefully monitored. However, experience in previous years found that few if any of these eggs would have hatched and produced fledged young if left in the nests, so the experiment is easily justified. 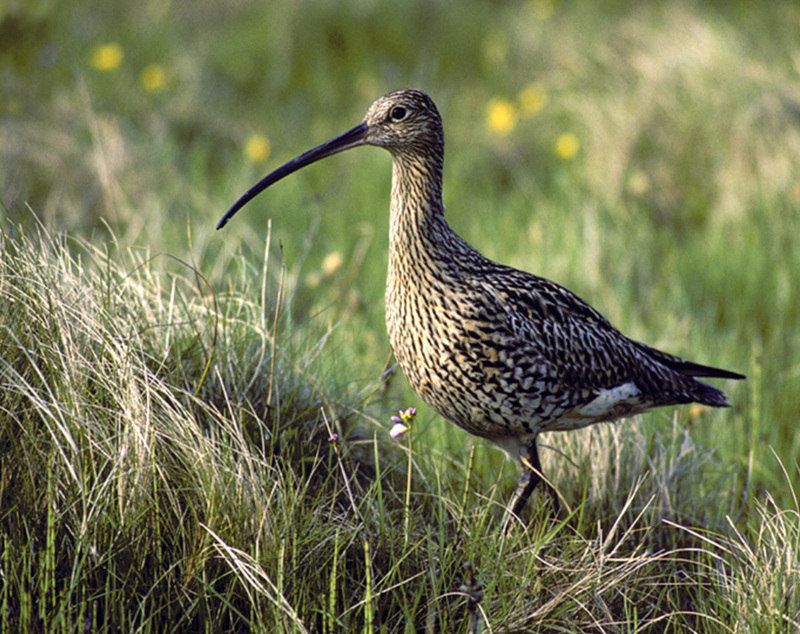 For more information, see the Curlew Country website www.curlewcountry.org. Over 160 Curlews have been caught and colour-ringed by Tony Cross since 2015. If you see a Curlew, please check it for colour-rings. More details can be found here. You can also report any observations to Leo Smith. 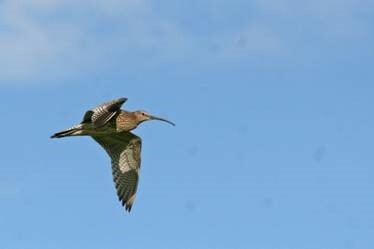 SOS members, and anyone else interested in saving Curlews, would be very welcome in any CWG, and be a big asset. Basically, you take on a survey square (a ‘tetrad’, a 2×2 kilometre square on the OS national grid – the same survey unit as the Bird Atlas), and walk round it three times on dates to suit you, around 1 April, 1 May and 15 June, for around 3 hours each visit. The areas covered by the various CWGs, overlain on the Curlew distribution map from the 2008-13 County Bird Atlas, can be found here. Help with the organisation and recruiting new members would be especially welcome. Finding and protecting nests, and extending this work to new areas, costs money, and needs to continue for many years, so please support the Appeal as often as you can. If anyone wants to help with Curlew monitoring work by the various Community Wildlife Groups, or locating nest sites, or has any ideas about who we can approach for funding or how we can raise more money for Curlew conservation, please contact Leo Smith (contact details below). In addition, records of Curlew territories elsewhere in the County are helpful. If you know of one, but haven’t reported it yet, please tell the County Bird Recorder or Leo Smith. The forum exists to promote Curlew conservation, and exchange information between projects to promote good practice. See www.curlewcall.org. The SOS representative for the “Save Our Curlews” campaign is Leo Smith 01694 720296 (leo@leosmith.org.uk).